Pull Cable Tension Monitor helps prevent errors for contractors. PreventingÂ cable overstretch that can lead to faulty cable installation, touchscreen-operated G-Series Smart Pull produces physical, visual, and audible alerts to let contractors know whenÂ pulling force of cable exceeds 80%Â ofÂ manufacturerÂ recommendations.Â Second alert is given when pulling force has met 100% of tension limit (10,000 lb max). Stored directly in 128 MB onboard memory, information obtained during pull can be exported via onboard USB port or emailed via PullCalc app. 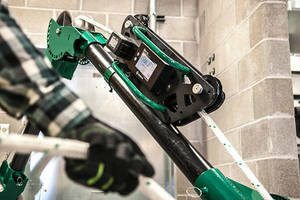 Rockford, IL -- Greenlee, a Textron Inc. (NYSE: TXT) company, has developed the patent-pending G-Series Smart Pull, a real time cable pulling monitoring system designed to alert contractors when a cable pull has met or is exceeding the amount of tension recommended by the cable manufacturer. This saves contractors time and money by avoiding overstretching the cable leading to faulty cable installation. The new Greenlee Smart Pull alerts the user when pulling force exceeds 80% of the cable’s limit. Physical, visual, and auditory warnings allow the worker to take action before the cable is damaged. A second alert is given when the pulling force has met 100% of the manufacturer’s recommended tension limit. The Smart Pull has an accuracy of +/- 2 percent up to a load limit of 10,000 pounds (44.48 kN). Information obtained during the pull is stored directly onto the Smart Pull’s 128MB of onboard memory. Pull data can be seamlessly exported via the onboard USB port or emailed directly through the PullCalc app. “This proof of work helps contractors to avoid liability and provides building engineers with documentation that the cable was pulled to specification,” added Pujari. A modern touch screen interface makes the Smart Pull easy to operate. The on-screen prompts make setup simple, and the unit is equipped with Bluetooth® technology, allowing connection to Greenlee’s PullCalc app. This application monitors pull force, speed, and distance in real time. An external USB port exports files in .CSV format. Files can also be transferred to the mobile app and emailed to other stakeholders. The Smart Pull is compatible with rope sizes up to 7/8-inch diameter. The five-roller design holds the rope in place and maintains consistency to the sensor, eliminating the need to specify rope diameter. The Smart Pull operates on the 18V Makita® battery platform, and is compatible with 1.5Ah to 5Ah batteries. A single 5Ah battery will run for 20 uninterrupted hours. The lightweight skeletal design and roll handles make this device easy to handle on the jobsite. The product comes in a carrying case with mounting hardware, battery and charger. It is compatible with the existing Greenlee Mobile VersiBoom™ II and floor mounts. The new G-Series Smart Pull is a real time cable pulling monitoring system that provides an innovative solution for Faster, Safer & Easier® cable pulling from Greenlee. For more information, visit www.greenlee.com or call 1-800-435-0786. Greenlee Textron Inc. is known as a global leader in the professional tool category. The Rockford, Illinois-based company develops high quality, innovative products distinguished by customer-driven design and differentiated by supply chain excellence. It also leverages its powerful brands such as Greenlee Communications and Greenlee Utility in the electrical, construction and maintenance markets worldwide. More information is available at www.greenlee.com. Textron Inc. is a multi-industry company that leverages its global network of aircraft, defense, industrial, and finance businesses to provide customers with innovative solutions and services. Textron is known around the world for its powerful brands such as Bell Helicopter, Cessna, Beechcraft, Hawker, Jacobsen, Kautex, Lycoming, E-Z-GO, Greenlee, Bad Boy Off Road, Textron Systems and TRU Simulation + Training. For more information visit: www.textron.com. *Bluetooth® is a registered trademark of Bluetooth, Inc. Makita® is a registered trademark of Makita Corporation. Tension Meter measures elevator wire rope tension. Tension Meter ensures correct timing belt tensioning. Belt Tension Meter helps optimize transmission performance.